We are losing ground at the noment at the rate od 2 votes every 2 hours. Now 10 ahead, so come 10 hours time, Rhydian will be back in front. Unless we get some more votes in. It would be good if we could build up a sizeable lead, like a coupl;e of hundred votes, that might put them off a bit. Hayley reigns supreme for the second fortnight in a row. I can't help but notice how well Hayley related artists are doing! (Raven, Pavao, Fiona) I think I know who is behind their votes (especially Pavao Quartet that jumped 40 places!) So thanks guys! (you can see their places in the full chart. Actually it may not be who you think, but I will vote for the Pavão Quartet, Raven and Fiona Pears as well as Hayley from now on. 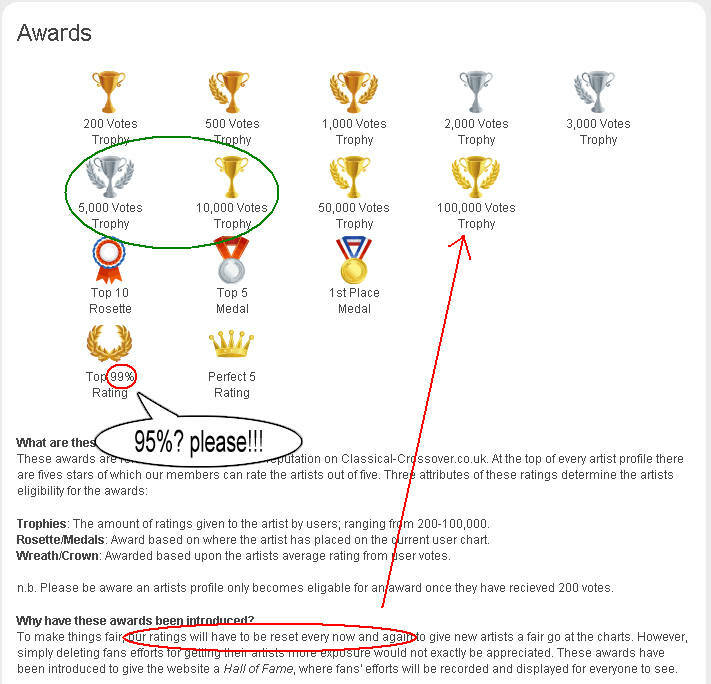 Hi everyone, Nicola's added shiny new trophies today for voting achievements. Hayley's only 600 short of earning her complete set of angel wings to go with her trophy so please keep voting!! LOVE the artwork going on there! Pavão Quartet and Raven are the only artists to have score related trophies (Perfect 5 and Top 99% respectively). Don't know how attainable 100,000 is - trial and error I guess. Ratings will be reset in December. I'm still plugging away. I don't know if you've noticed, but your Karma rating has gone up a bit too! 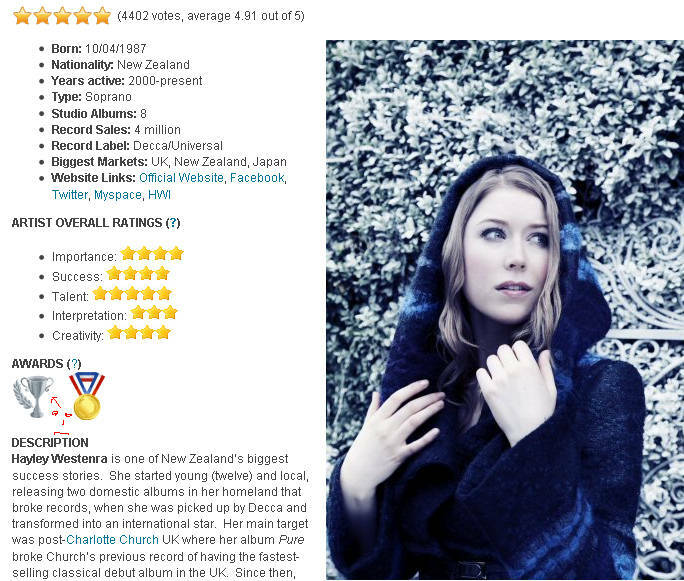 Go to www.classical-crossover.co.uk/artprofiles/125-hayley-westenra.html and vote, five stars of course!!! Some people don't do A/B comparisons of artists singing the same song obviously!!! The charts have been updated. Hayley's lead over Sarah now down to around 160 votes. We need more votes. Keep at it. You need to register/login to vote. Voting very slow today, Hayley has only gained about 10 votes in the last 12 hours. Is everyone at the Classical Brits? We need more votes for Hayley - Sarah B is gaining again. Hayley's lead has gone from 200+ a few days ago to 167 tonight. Click on the link and vote - it only takes a few seconds. Yes, I clock her lead every morning at 9am. She is losing between 5 and 10 votes a day to Sarah. That isn't many, only one consistent voter could reverse that. It could be YOU! I think Sarah's votes are likely to go up over the next few days due to my tenth anniversary La Luna review posted up yesterday. Her community are visiting the site to read it. I don't vote at all.